Saw this lonely last bottle on the shelf of this medium bodied red wine made from the Gamay grape and was intrigued being that a couple nights back i heard someone say “Why don’t more people drink Beaujolais?” Well, it’s all about the moment and experiencing new things, right? To be honest, I have had very few Beaujolais besides what you typically find on Amercan shelves like The Louis Jadot varieties and a bottle or two of Beaujolais Nouveau over the Holidays; ( My deep dark secret.) 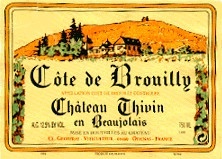 But Brouilly Beaujolais are supposed to be a bit fuller and richer than some other Beaujolais and figured 6 years of aging by what I had read about these wines was perfect. With a nose of sharp musk and heavy wood, this wine is dominated by tartness accompanied by fruit flavors of cherry, mild mango and orange towards the back end of the mid palate venturing into the faint finish. I appreciated the experience of trying this wine, but would probably not drink it again. Keep Drinking and Keep Believing. 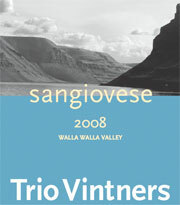 It has been quite the ride in a positive way tasting these series of wines by Trio Vintners and i was curious to experience their take on the Tuscan trademarked treasure, Sangiovese. Sourced exclusively from Walla Walla Valley, this mild, polished wine offers graceful layers of clove, musk, chocolate, red cherry and dried cranberries while lending a subtle, lengthy finish of vanilla laced perfume. Truly hit the spot with my boneless, lightly seasoned, pork sirloin chops and pasta dinner. Keep Drinking and Keep Believing.